Sloping from Broadway to Church St, and from Liberty to Cedar, Liberty Plaza’s 20-foot grade change presented a challenge to architect Alexander Cooper. Hired by Brookfield Financial Properties to reconstruct this downtown block, Mr. Cooper came to a supportive Community Board 1 last week with a large model and diagrams to show his proposed plan. Popular with lunching workers, tourists at rest, chess and backgammon players (at least in warm weather), and commuters who appreciate a diagonal shortcut from the PATH terminal toward Wall St, the plaza was due for a structural and cosmetic upgrade even before 09/11. Brookfield owns and maintains the plaza, originally built by U.S. Steel in return for a height bonus when it constructed One Liberty Plaza in 1972. Between his co-creation of the Battery Park City master plan in 1979, and his current work guiding the Downtown Alliance Streetscape project, Mr. Cooper has worked on various projects in Lower Manhattan (and around the world). Comfortable enough with the history, people, and elements involved, he offered a radical idea: imagine this block as a flat, geometric plane, and then tilt it so that one may walk from the corner of Liberty and Church Sts to the corner of Broadway and Cedar Sts without climbing a single step. A grove of 55 honey locust trees will be planted along the diagonal, shading wide stone benches. Steps will be built at the two opposite corners, Liberty/Broadway and Church/Cedar. One large tree, a London plane, will mark the commuters’ preferred path, at the northwest corner (Liberty and Church). Black cylindrical light poles with silver bases, identical to those commissioned by the Downtown Alliance, will line the perimeter of the plaza. In one of the few reservations stated by CB1 members, Julie Menin said a lighting consultant hired by her group, Wall Street Rising, has found the Downtown Alliance lights too bright, and she asked Mr. Cooper and Mr. Graham to consider a more subdued light. With a flourish, Mr. Cooper turned off the overhead lights in the meeting room to show the plaza’s main source of lighting. Glowing from the pavement (at this meeting from the base of the model), embedded lights will shine upward through the trees. A proposal to build a PATH entrance/exit near the southern Cedar St corner was turned down by Brookfield, according to Mr. Graham. “Cedar St is probably where the vendors will set up again,” he said. Once construction begins this spring, the plaza will be impassable. If the weather cooperates, Mr. Graham said the work should be done by the end of the year. Finally, CB1 members wanted to know if the statue of the seated man with his briefcase - “Double Check” by Seward Johnson – would be returned to his bench. Mr. Graham said not to count on it. Last edited by ZippyTheChimp; August 19th, 2005 at 07:34 AM. I had read that the concrete plaza on B'Way between Liberty and Cedar would be redeveloped, and I noticed that wooden boarding was erected around its perimeter yesterday. Does anyone have photos of what the new plaza will look like? Hopefully, they'll replace the concrete with grass and put in trees. A fountain would be nice too. Tuesday, July 12: The tall informational kiosk that once stood at the corner of Liberty Park has been relocated, the Daily News reported. Owned by the Alliance for Downtown New York, the cylindrical, map-laden kiosk can now be found in the small park near Greenwich Street and Trinity Place. It could never be just another park renovation. For when it is completed next spring, the $8 million reconstruction of Liberty Plaza Park, across from ground zero in Lower Manhattan, will signal more than just the return of a cherished oasis in the forbidding canyons of the financial district. It will also mark the rebirth of another significant fixture of the neighborhood torn asunder by the attack of Sept. 11, 2001. "This is the final piece of the puzzle for us, the last thing that was destroyed that we can put right," said Ric Clark, president and chief executive of Brookfield Properties, which owns the park. Brookfield has finally won approval to refurbish the 32,756-square-foot space, which is bounded by Broadway, Cedar Street, Liberty Street and Trinity Place. Last Monday, construction barriers closed the park. When they are removed next spring, the formerly bare-bones, concretized park will be shaded by a canopy of 54 honey-locust trees above granite seats, tables, planters and pavement. At night, the park will be illuminated by 500 white fluorescent lights flush with the ground. Then the park will also celebrate the return of the lifelike "Double Check," the bronze sculpture by J. Seward Johnson Jr. of a fellow with a briefcase that inhabited the original plaza for decades. The sculpture, coated with toxic dust, was undamaged by the collapse of the World Trade Center and, bedecked with mementos, it became an emblem of survival. Its rededication will be "a gesture of renewal toward ground zero," said Sabrina Kanner, vice president of design and construction at Brookfield, who added that the park would be the future home of "Joie de Vivre," a 70-foot-tall, red-painted sculpture of welded and bolted steel by Mark DiSuvero. It will be the first permanent public installation of one of the 72-year-old sculptor's works in Manhattan. The park "is the right place to celebrate the joy of life," Mr. DiSuvero said, referring to the title of his work, which will be situated in the southeast corner. For decades, the park provided a vital timeout for office workers who sat on the steps, lined up at Sam's Falafel and the other carts on Broadway, and checked out the street jugglers and backgammon amateurs while wolfing down lunch. Its celebrated chess and checker games were spectator sports. As one of the few oases in Lower Manhattan, and the midpoint between City Hall Park and Battery Park, "it was a very-well-used public space, though its esthetic may have been hard-edged," said Suzanne O'Keefe, vice president of design for the Alliance for Downtown New York, the local business-improvement district. And its role as a pedestrian traffic corridor to the financial district was so vital at the morning and evening rushes that "trying to walk in the opposite direction was like being a salmon going upstream," Ms. Kanner said. 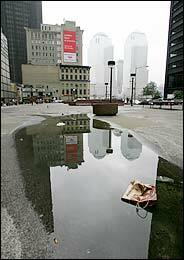 After 9/11, the park was covered with debris and more than a foot of toxic dust. 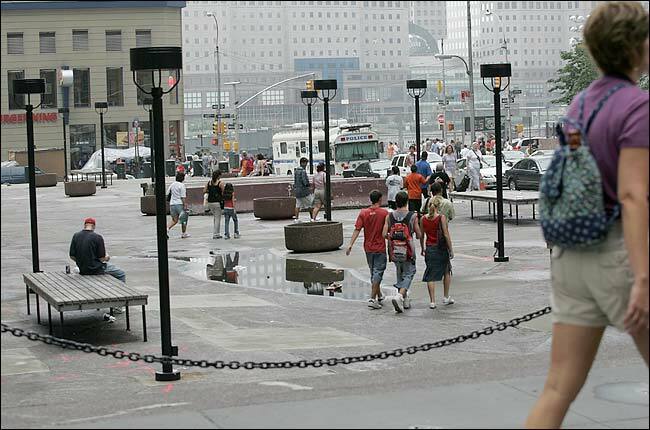 Immediately, the Federal Emergency Management Agency and the New York City Department of Design and Construction established it as a staging area, since the raging fires at the trade center site made the park one of the few safe open spaces. In 2003, the city and federal crews returned the property to Brookfield after patching the site with concrete, cleaning it up and installing lighting and temporary benches. Now treeless, it reopened. "We thought we'd be able to jump right in then and put in a new park," Ms. Kanner said. But renovation plans were put on hold while potential uses for the park's below-grade space were studied. Ultimately rejected were plans for underground parking, a Verizon cable vault and a subway entrance. The rescue crews' heavy construction vehicles extended sinkholes on the property because the original park had been built over the back-filled foundations of demolished buildings. The debris settled, creating voids. And so, the contractor, the Turner Construction Company, will have to excavate from 8 to 20 feet below grade to prepare the new park's foundation. "Not only did we want to provide a great public amenity," Mr. Clark of Brookfield said, "we wanted to do something very special at the park, given its unique history. This is a gateway location in Lower Manhattan, and given the new residential growth in the community, the park will be even more important than it was in the past." The project, financed by Brookfield, will be fully paid for privately. The park was built in 1974 in a trade-off that let the developer add seven stories to 1 Liberty Plaza, the office tower across the street; the park could only be completed when a holdout, a Chock Full O' Nuts store, was razed in 1980. The 68 trees on the site in 2001 died or were removed by the emergency management agency. "We wanted to put back trees to establish a quiet oasis of shade," said Ralph A. Ottaiano, the project manager for Cooper Robertson & Partners, the firm that designed the park. The 54 new 15-foot-tall honey locusts will be "hardy street trees that will provide a lacelike canopy," Mr. Ottaiano said. The site is challenging, he said, given its 13-foot drop from Broadway down to Trinity Place, the southern extension of Church Street. And so, stairs to the east and west will lead in and out of the park. A key task was "to figure out how to handle the extraordinary movement of people through the site," Mr. Ottaiano said. A central corridor will keep foot traffic away from the more contemplative areas of the park, including board-game areas in the southwest and northeast. The trees will line up diagonally, as well as to the north and south and east and west, in an intricate pattern that provides multiple-view corridors. Replacing the former park's brutalist original surface of "rustic terrazzo" - basically, concrete studded with large chunks of aggregate - will be a new park surface of 18-inch-by-36-inch paving stones of Atlantic pink granite. Granite benches will be set three feet apart to permit friendly interaction for up to 700 visitors. There will be three low circular flower beds filled with perennials. The old heavy, pinkish exposed aggregate concrete planters that looked like giant ashtrays will be replaced with low granite planters intended to serve as visual, traffic and noise barriers. The park's illumination will be provided by 500 3.75-inch-by-36-inch fluorescent lights set into the paving stones and sealed in waterproof, dirtproof housings. Lighted railings will punctuate the stairs. "Double Check" will occupy a northwest location near its former spot in the park, part of a circular row of granite benches under a 35-foot-tall London plane tree. "I feel so happy that he's coming back," Mr. Johnson said. "I thought of him as a businessman everyman - with his briefcase - getting ready for his next appointment, and people identified with him. So when he survived, it was as if he was one of them - surviving as well." Mr. Johnson, 75, was not reunited with his sculpture "until a month and 10 days afterwards," he said, adding, "I broke into tears when I saw it." Ground zero workers told him that the sculpture "gave them the first smile of that day," he said of Sept. 11. So lifelike and dust-covered was the figure "that they wanted to rescue him," he said. Mr. Johnson moved it back to his studio in Hamilton, N.J., took digital photos and molds of all the memorabilia on the statue, then removed it all and cleaned up the sculpture. Then Mr. Johnson made a new sculpture incorporating bronze castings of the memorabilia, which he welded to a duplicate of the original statue. The new version, he said, will become part of a Jersey City Sept. 11 memorial. Mr. DiSuvero's sculpture will be at the opposite, Broadway side of the park. The artist said he was gratified that since he has been a resident of Lower Manhattan since 1959, one of his works had finally been permanently embraced by the neighborhood. By spring 2006, 55 new trees will bloom there. Two remarkable pieces of art will add decoration. Dozens of shady benches will provide respite to tourists and prime lunching spots for workers and residents. Welcome to the future Liberty Plaza Park. Located between Broadway, Church, Liberty, and Cedar Streets, the park is undergoing a reconstruction that will create a public sanctuary in the heart of bustling Lower Manhattan. Owner Brookfield Properties, with the help of architects Cooper Robertson and other collaborators, kicked off the $8 million renovation on July 18 -- adding another major private investment to the area's revitalization. Rebuilding the park, which was already due for a restoration of its unstable, sub-grade foundation, became a priority for Brookfield after the 9/11 recovery effort. Cleanup and emergency vehicles and equipment were staged in the plaza for months following the attacks, cracking and denting its pavement and further stressing its foundation. The circular bench on the park's NW corner will be home to "Double Check"
The new design is a welcome change from the previous incarnation of Liberty Plaza Park's all-pavement, barebones layout, bringing welcome foliage to the Financial District's skyscraper canyons. "This is a true amenity for Lower Manhattan," Brookfield Vice President Sabrina Kanner says. "It's a dense and compact neighborhood -- so you really notice and enjoy a park." Fifty-four hearty honey locust trees will be planted across the park's nearly 33,000 square feet, along with one towering London plane tree, which will sit at the northwest corner, nearest to Ground Zero. A granite bench will encircle the London plane, where one permanent guest will be seated: a bronze sculpture called "Double Check." The piece, by New Jersey-based artist J. Seward Johnson Jr., is of a life-size, seated businessman peering into his briefcase and was a Liberty Park Plaza fixture for decades. Decorating Liberty Plaza Park's southeast corner is another sculpture, a soaring steel piece titled "Joie de Vivre." The 70-foot-tall, bright red sculpture by Mark di Suvero will be a marker along Broadway, easily seen from City Hall and down adjacent streets. It will complement the giant, red "Noguchi's Cube" across the street at 140 Broadway. The redesigned park will bring several logistical improvements. Most notable among them will be the diagonal layout of benches and the center pathway, which will help accommodate the tens of thousands pedestrians who walk between the northwest and southeast corners every day. On their way through the park, passersby will notice the "Atlantic pink" granite pavement and more than twice the seating of the original park -- all installed on the same diagonal as the center path. Planters at the park's southwest and northeast corners, as well as throughout the park's interior, will yield color and seasonal plantings. Illuminating the park are nearly 500 thin, rectangular, in-ground fluorescent lights, specially designed to be water- and air-tight, as well as easily replaceable. The Alliance for Downtown New York will supply additional street lamps along Broadway, as well as Ticker-Tape Parade granite sidewalk markers, consistent with its downtown "Streetscape" program. Logistically, the 10-month project will involve demolition and excavation down to about eight feet sub grade, followed by recompacting the soil below to create a level base and prevent future uneven settlement. Because the park was built over Temple Street, which ran north-south through the center of the park until the 1960s, contractor Turner Construction is prepared to coordinate leftover underground infrastructure work with the city and utility companies. Apart from the closure of Liberty Plaza Park, sidewalks, streets, and bus lanes will be minimally affected by the project. Staging for the reconstruction will occupy eight feet of Liberty Street, but the street will otherwise remain open to vehicles. A complete renovation of Liberty Plaza Park, located in the heart of Downtown Manhattan between Broadway, Trinity Place, Liberty and Cedar Sts., has been underway for a month making way for the improved 33,000 sq. ft. public space expected to re-open next summer. The $8-million project funded by owners Brookfield Properties is one of several revitalization efforts in progress in Lower Manhattan. “It’s going to be so much better than it was,” said company spokesperson, Melissa Coley. “It’ll be much more of a gathering place for the community. Before [the plaza] was basically a thoroughfare and now it’s going to be a warm and inviting place with trees. And it’s great because there are so many more families downtown than there were a few years ago, that they can use all the park space they can get,” she said. Major elements of the renovation include diagonal pathways traversing the park, 54 honey locust trees, one London plane tree, two art sculptures and twice as much seating space as before. More than 35,000 sq. ft. of Atlantic pink granite will cover the plaza and 16 granite tables for playing chess will be installed under the design by Cooper Robertson. Tourists visiting the park can experience the joy of walking beneath Mark di Suvero’s 70 ft. sculpture “Joie de Vivre” on the park’s southeast corner and lunch time park goers can once again snack beside J. Seward Johnson’s, “Double Check,” The life-size bronze sculpture depicting a businessman looking into his briefcase became a makeshift memorial after 9/11 as a symbol for the workers who died in the towers. Di Suvero’s sculpture used to be in Tribeca in the middle of the Holland Tunnel exit rotary. Plans to rebuild the park had been in the works before 9/11 but became a priority after sustaining irreparable damage as a result of the attacks. Following the collapse of the World Trade Center, Liberty Plaza Park became an emergency staging area for the Federal Emergency Management Association and the Dept. of Design and Construction until 2003. Mark di Suvero and Spacetime C.C. 1997 photo “Joie de Vivre,” Mark di Suvero’s 70-foot sculpture that once was in the Holland Tunnel rotary and will return to Liberty Plaza. We had been continuing discussion of the park at a newer thread. What was it doing in Real Estate? I like it all except for Joie de Vivre, which seemed more appropriate in the middle of the Holland Tunnel roundabout. The plaza may actually be completed on schedule - this summer. Am I the only one who has an urge to put the cube on top of that tripod?